Given the multifactorial state of autoimmune complex diseases such as multiple sclerosis (MS), it is not clear if different risk factors act jointly or independently. Despite intensive studies investigating multi aspects of MS risk factors, findings with regards to potential biomarkers that may link these risk factors remained largely inconclusive. System biology or data integration utilizes different validated datasets to extract meaningful information and map the plausible biological pathways and networks. As such, we integrated eight transcriptome datasets to find the differentially expressed miRNAs in peripheral blood (PB) between relapsing remitting MS patients (RRMS) and normal group. After identification the targeted genes of miRNAs, the hub genes were used to construct the underlying protein–protein interaction network and signaling pathways. As results, 9 miRNAs were best exemplified by significant dysregulation including hsa-mir-15a, hsa-mir-484, hsa-mir-30d, hsa-mir-145, hsa-mir-363, has-let-7e, hsa-mir-30a, hsa-let-7b, and hsa-mir-146a. System biology analysis of miRNAs in PB of RRMS patients clearly indicates the involvement of miRNAs in many vital pathways and highlighted the possibility of an association between miRNAs with EBV and vitamin D in MS pathogenesis. Described novel pathways and genes related to miRNAs such as Transient receptor potential channels and Acid sphingomyelinase may provide a potential target for therapeutic approaches although further functional studies are warranted to test these candidates. A phd thesis freely avaliable about exosomes and miRNA, in case anybody is interested. What are exosomes and how can they be used in multiple sclerosis therapy? Expert Rev Neurother. 2014 Apr;14(4):353-5. 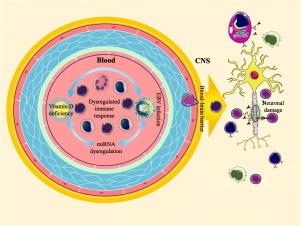 Environmental Enrichment Stimulates Immune Cell Secretion of Exosomes that Promote CNS Myelination and May Regulate Inflammation. Dysregulated EBV infection in MS. Old but relevant. They know since 2007 that EBV is to blame. What are they waiting for to try antiviral therapies?? EBV: Leukocytes could be unable to control EBV infection.